What would happen if you stopped brushing your own teeth? Even if you only ate hard food, as most dogs do, there still would be problems. 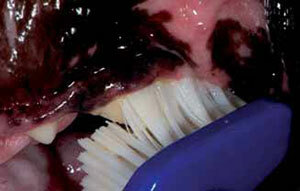 You should be brushing your dog’s teeth twice daily if you can manage it; it’s not as difficult as you might imagine. What are the benefits of brushing? Brushing removes daily accumulation of plaque from the teeth. 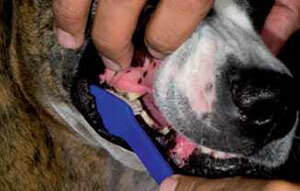 Even though dogs do not commonly get cavities, they do suffer from periodontal disease. If untreated, gum disease can lead to bad breath, pain, and tooth loss. Save yourself time by not buying a child’s toothbrush, which is usually too hard for dogs. The ideal dog toothbrush will have a long handle, an angled head to better fit the mouth, and extra soft bristles. For dogs less than 30 pounds, a finger toothbrush that fits over the tip of your finger works well. The best pet toothpastes contain enzymes that help control plaque. Try to avoid toothpastes with baking soda, detergents, or salt that are sometimes found in human pastes. Fluoride may be incorporated to help control bacteria. Place the toothpaste between the bristles as this allows the paste to spend the most time next to the teeth and gums. Step three is to get the brush with paste into your dog’s mouth to get all the teeth brushed. How do you Brush your Dog’s Teeth? Gently pull the upper lip upwards to expose the teeth. In a back and forth motion, press the brush to the outward surfaces of the upper tooth and gum line. Move to the outward surfaces of the lower teeth and brush in the same back and forth motion. Don’t forget the incisors and canines. The bristles should be below the gum line. 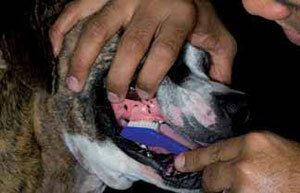 Most dogs accept brushing if they are approached in a gentle manner. If you can start when they are young, it’s quite easy, but even older pets will accept the process. Start slowly; you can use a damp washcloth or piece of gauze to wipe the teeth, front and back in the same manner you will eventually be using the toothbrush. Praise your dog during the process and offer teeth-healthy treats, such as dental chews, as a reward. Do this twice daily for two weeks, or until your dog is familiar with the approach. Then take the pet toothbrush, soak it in warm water and start brushing daily for several days. When your dog accepts this brushing, add the pet toothpaste. Most attention should be given to the outside of the upper teeth. The toothbrush bristles should be placed at the gum margin where the teeth and gums meet at a 45-degree angle. The movement should be in an oval pattern. Be sure to gently place the bristle ends into the area around the base of the tooth as well as into the space between the teeth. Complete ten short back and forth motions, then move the brush to a new location. Cover three to four teeth at a time. Dog home dental care should include daily brushing using an enzymatic pet toothpaste and a proper toothbrush. Taking an active role in your dog’s dental care will help reduce dental disease, bad breath, and potentially life-threatening heart and kidney disease. Everyone wins. Copyright 2013 – 2015 by the Veterinary Information Network, Inc. All rights reserved.